It took a great deal of effort to get up on day two! The altitude affected my breathing all night, and I could not get comfortable from any angle. I kept reassuring myself that the next two camps (as it turned out, all later camps!) would be lower down and easier to tolerate; after a while this got me moving out from under my rainfly and back into the world. Julie had fared worse due to her cold, and Larry therefore was also not rested. We groggily packed up under a typical cloudless morning and trudged upward. As is usual with pass approaches, the views improved with each step. Soon both Piute Lake and Loch Leven were revealed behind us, hovering over the brink of the bench that led back to North Lake, while peaks of the Glacier Divide began peeking over the low lip of Piute Pass. Several people passed us by as we steadily ground out the last mile, confident that the downhill section would follow soon. Among the passers-by was a woman with two llamas: a friend of 'sierramel', she was working her way down so she could support her friend somewhere near Taboose Pass. As we reached our pass we encountered two men relaxing there, 'fresh' from their climb of Mt. Humphreys. That's quite a trophy, and the ragged mass of that peak dominated the northeast horizon while we chatted with them. We finally re-shouldered our gear, said farewell and dropped down to southern Humphreys Basin. Another cloudless day revealed the Glacier Divide in all its ragged glory, and soon we encountered someone who had just come over it somewhere. 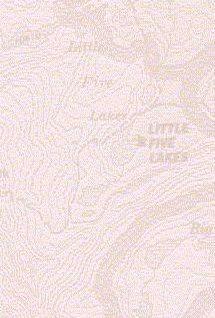 He referred to his route as the Keyhole, but that name refers to a spot closer to Piute Pass than his indicated route. Wherever he went, it was clearly spooky and exhilirating! 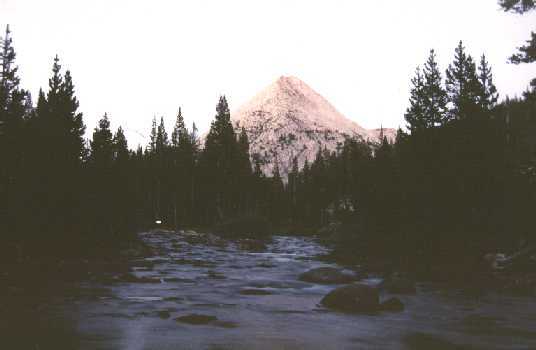 As we dropped nearer the treeline, a line of stones blocked the trail and sent us left toward the Golden Trout Lakes. At the small upper lake we stopped, ate lunch and pulled out maps - the main trail does not go here! We concluded that whoever blocked the route before had some explaining to do; Julie and I headed north and recovered the original trail while Larry went to the lower lake and followed the creek to join us. The grade steepened and dropped into the trees, and by late afternoon we were hopping over the creek from French Canyon. All the guidebooks that warned me about the tricky creek-crossings must have been written in June, since the trickles did not get our boots wet. The Hutchinson Meadow junction was familiar to me: I had reached here in '96 when my sore leg short-circuited our trip to Evolution Valley and Lamarck Col, and we exited directly over Pine Creek Pass. I remembered that a few campsites could be found farther down the canyon, and I vaguely referred to a gorgeous memory of Piute Creek dropping three times in succession. I wasn't sure any camps were near there, though, so we played it safe and made camp by Piute Creek, within fifteen minutes of the junction. We arrived early enough for me to wash some clothes, and Larry pulled in a gorgeous golden trout that I captured with my camcorder. I had purchased a two-day permit so my time wouldn't come until days four and five, but my brother bought the 10-day and could fish anywhere, anytime - and he did! Our camp was troubled by a few evening bugs, but again my tentless camp was effective.